When operating the climate control, the air that enters the passenger compartment through the air vents can be very hot or very cold (depending on the set temperature). This could cause burns or frostbite to unprotected skin in the immediate area of the air vents. 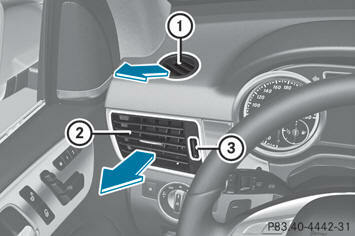 Always keep sufficient distance between unprotected parts of the body and the air vents. If necessary, use the air distribution adjustment to direct the air to air vents in the vehicle interior that are not in the immediate area of unprotected skin. In order to ensure the direct flow of fresh air through the air vents into the vehicle interior, please observe the following notes: - keep the air inlet grille on the hood and in the engine compartment on the frontpassenger side free of blockages, such as ice, snow or leaves. 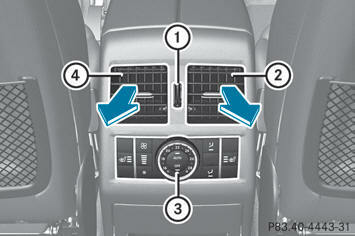 - never cover the air vents or air intake grills in the vehicle interior. 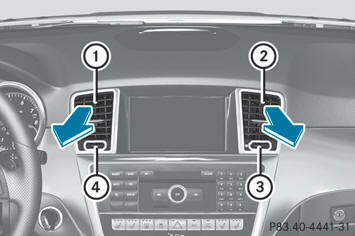 - To open/close: turn thumbwheels 3 and 4 to the right or left. - To open/close: turn thumbwheel 3 up or down. When automatic climate control is activated, the glove box can be cooled, for instance to cool its contents. The level of airflow depends on the airflow and air distribution settings. At high outside temperatures, open the air vent and activate the "cooling with air dehumidification" function. Close the air vent if you do not wish to cool the glove box or you have not switched on cooling with air dehumidification. Moisture-sensitive items stored in the glove box could otherwise be damaged. - To open: turn thumbwheel 1 counterclockwise. 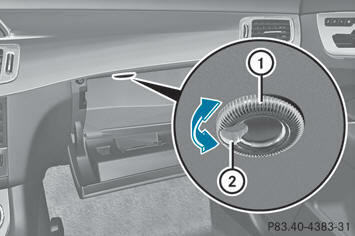 - To close: turn thumbwheel 1 clockwise. - To open/close: turn thumbwheel 1 up or down. 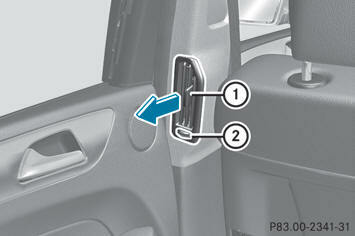 These rear-compartment side air vents are only available if your vehicle has 3-zone automatic climate control. - To open/close: turn thumbwheel 2 to the left or right.